Efficient and easy to use, the Jonsered GT 2228 string trimmer with curved shaft is powered by a 28cc 2-cycle gas engine, and provides a 17-inch cutting swath. The GT 2228 features Spin Start, making it extra easy to pull the starter cord and get going, while the auto return stop switch puts the machine back to the start position for trouble-free starting. The intuitive controls provide easy access to the choke and purge for smooth operation. It also features a twin line cutting system with Tap 'n Go for quick line feed. The Black & Decker ST7700 2-in-1 Trimmer and Edger is ideal to trims grass in hard to reach areas where mowers cannot cut and maintenance edging along hard surfaces. The 4.4 Amp motor cuts right through tough weeds, grass and overgrowth. Black & Decker 's Groom "N " Edge design converts from trimming to edging in just seconds. The BLACK+DECKER 20V MAX* SMARTECH String Trimmer (2 x 1.5Ah Batteries included) will trim tough overgrowth and edge borders easily and comfortably. Choose from two speeds, convert from trimming to edging in seconds, and advance the line without bumping. Manage the SMARTECH battery remotely via app and use it as a portable charger to charge your mobile devices for ultimate convenience. This ECHO+C144 most powerful and best performing brush cutter. It has a 42.7 cc Power Boost engine with outstanding professional grade performance. It comes standard with a 10 in. brush blade and metal debris shield. The offset U-handle is ergonomically friendly and the shoulder harness provides a better balanced unit when used for long periods of time. This unit has a 5 year consumer warranty and a 2 year commercial warranty. 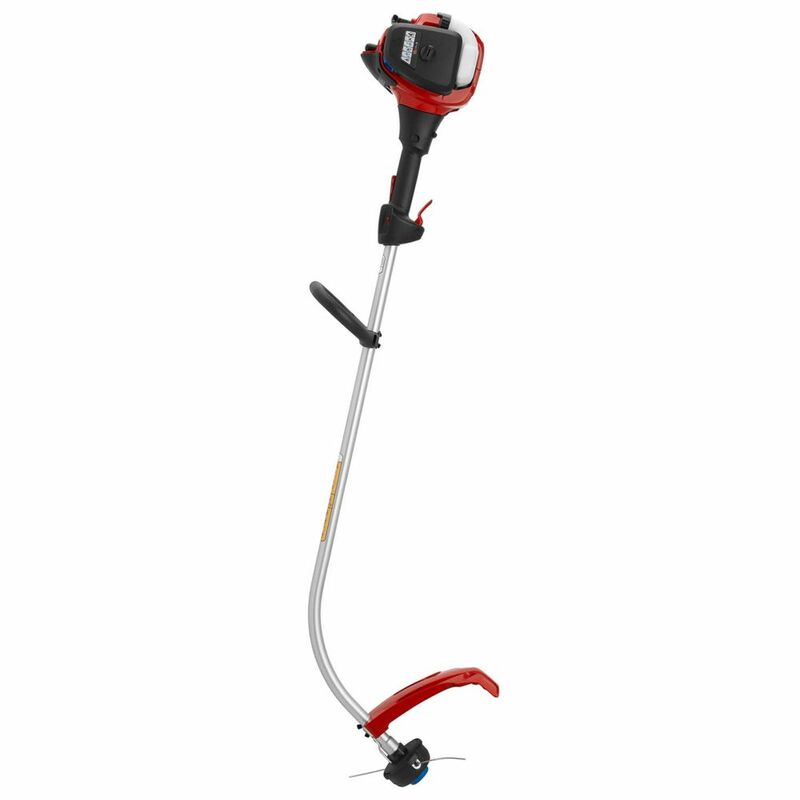 28cc Curved Shaft 2 Cycle Gas String Trimmer, GT 2228 Efficient and easy to use, the Jonsered GT 2228 string trimmer with curved shaft is powered by a 28cc 2-cycle gas engine, and provides a 17-inch cutting swath. The GT 2228 features Spin Start, making it extra easy to pull the starter cord and get going, while the auto return stop switch puts the machine back to the start position for trouble-free starting. The intuitive controls provide easy access to the choke and purge for smooth operation. It also features a twin line cutting system with Tap 'n Go for quick line feed.